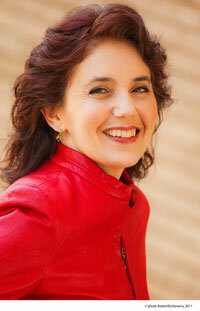 There are few performers who so seriously and irreproachably defend contemporary music as pianist Louise Bessette. She will be soon celebrating her thirty-year career by offering us not one, not two, but three different concerts—all in a single day, March 31st. Having amassed an impressive résumé, received laudatory reviews, recorded a rich discography of over twenty titles and organized the well-received event, Automne Messiaen 2008, her seemingly faultless trajectory easily intimidates. However, it took only two minutes in her presence to understand that, even if she lives and breathes a rare creativity, she has absolutely no problem with staying grounded in the real world. There is no pretense, no empty words. She has a contagious energy: her eyes smile like those of a child about to blow out the candles on a birthday cake and her honest laugh sweeps up everything in its wake. She doesn’t look a day older than 40, and yet, the Encyclopedia of Music in Canada tells us she was born in Montreal in 1959. Because her mother and her mother’s mother had both been organists at the Église de La Visitation, it is not surprising that Louise was taught to play the piano at five years old. In 1971, she was accepted at the Montreal Conservatory of Music where, working with Georges Savaria and, later, Raoul Sosa, she would win five first prizes. Under Sosa, she would seamlessly shift from Berg’s Sonata to Messiaen’s “Première communion de la Vièrge” from Vingt regards sur l’Enfant-Jésus. “I could not see the complexity,” she says, as if that had been a self-evident choice. She was nonetheless aware, at that time, that other pianists already envied the ease with which she tamed those pieces. A string of successes followed, including wins at the Eckhardt-Gramatté National Music Competition, Concours International de Musique Contemporaine in Saint-Germain-en-Laye, France, International Gaudeamus Competition for Contemporary Music in Rotterdam, Netherlands, and Québec-Flanders Contemporary Music Award. “Not once did I question the path that I took or what I wanted to accomplish. I did what I liked to do,” she says. “I enjoy discovering off the beaten path.” Her peers have also recognized her virtuosity and her vision numerous times. She has been awarded several Opus awards in such categories as “Best performer” and “Musical event of the year.” The latter was awarded for Automne Messiaen 2008, for which no less than fifty musicians, ensembles and organizations took part. These included the Quatuor pour la fin du temps, now ARTefact, an ensemble in which Louise Bessette is joined by Simon Aldrich, Yegor Dyachkov, and Jonathan Crow. ARTefact will perform during this year’s thirty-year celebrations, at the first concert. Four pieces will be heard for the first time on March 31st. “The creators are the voice of a nation and each creation is an important moment of music,” she tells us, believing that the premiere of any work allows for a second moment of creation. Michel Boivin’s Les Cinq Éléments for solo piano will be performed, as well as Ana Sokolović’s City Songs (performed with Olga Ranzenhofer), a new work from Michael Oesterle, and Serge Arcuri’s Les Sabliers de la mémoire. Bessette discovered Arcuri in 2004 through Fragments, which is on the ATMA album Migrations, which won an Opus award last January. The pianist will then present a solo recital based around Scelsi’s Suite No.9 (Ttai) and Walter Boudreau’s Les Planètes. “Scelsi is a composer I relate well with. His world is very private, quite the opposite of Boudreau, who has written a rather explosive piece. After a violent start, the music slowly bares itself, progressing into a magical flourish.” The final program, a first-time collaboration with Peter Hill, is centred around the outstanding four-hand version of Stravinsky’s The Rite of Spring and, naturally, Messiaen’s Visions de l’Amen.